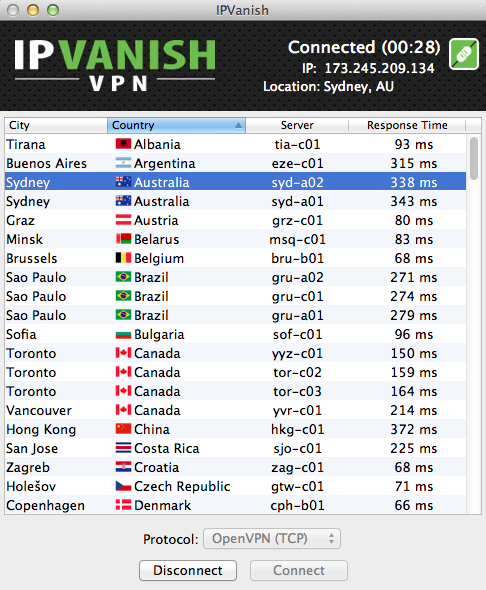 IPVanish (IPV) is a relatively newcomer to the VPN world and have been around from the last 3 years. It’s building out it’s network rapidly and acquiring a large base of customers. They are based in the USA. We’ve found the staff at IPV fast to respond to our support queries and sometimes creative with their solutions to fix issues. Unlike a lot of other VPN providers, IPV’s staff are all highly trained on getting users up and running with their software. They are so sure that you will love their product that they offer a 30 day money back guarantee. In some of their advertising, IPV says that they have over 14,000 IP addresses that they manage. Our estimate that this is on the a conservative number. IPV rotates IP blocks in and out as needed in locations, this is especially useful if you are using a VPN to unlock content like Netflix in different countries. IPV supports all major operating systems, with desktop clients for OSX & Windows. For Linux users it supports configuration with Linux CLI OpenVPN Client. IPV has iOS & Android apps that you can use with your smart phone or tablet. From the software you can select the individual server you would like to use, or you can select just the country. Selecting just the country will have IPV connect you to the fastest servers available. Buying a plan for a year (with our coupon link) saves you 52%, and comes out at $4.87 / month. This offers some great value for money when you think about the daily price of $0.16 and with that you can have the added level of security and anonymity online. IPVanish supports over 20 different payment methods including PayPal, bitcoin & Paypal. You can just how many they offer in the technical details below. IPV has a 7 day money back guarantee which is about average for VPN providers. IPV accepts quite a lot of different payment options, including bitcoin. Requesting a refund is straight forward and easy to do. After the 7 days you should have a reasonable enough idea whether their service suits your needs. Another plus for IPV is the fact being a US company they are not required to maintain user logs. Their network is one of the fastest we’ve tested, even for servers that are across the world. IPV doesn’t have bandwidth limits, and this is a service that you could use for P2P and bit torrenting. It is required to have an email address for signing up to IPVanish. You can of course use a free email address like gmail.com that you just create for the service. Besides that we think that if you choose IPVanish you will be pretty happy with what they offer. You can sign up for at IPVanish.com. Using this link you will automatically get the 25% off your first purchase for VPN.ie customers with code VPNIE. The link ads in the code for you automagically !